It didn’t take long to notice I was clearly amongst a mostly 30+ crowd looking for a shot of nostalgia and to relive some stripped down anthems that once defined their youth of yesteryear, as I stepped foot into the Queen Elizabeth Theatre on Wednesday night. 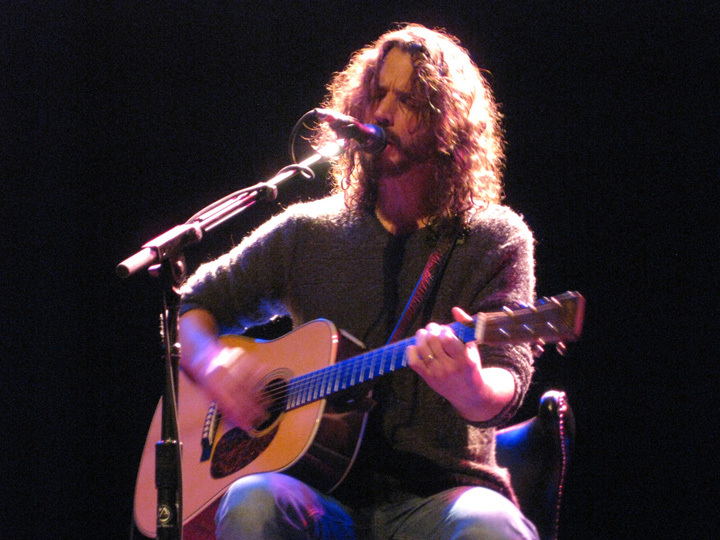 With the smell of incense filling the air, a very jovial Chris Cornell outfitted casually in a v-neck sweater and jeans took the stage to a standing ovation, bowing and appearing genuinely flattered by the adoration as he propped himself on what looked to be a barstool centre stage. He was surrounded by the typical acoustic and electric tools of the trade and a few unusual stage props such as an old fashioned telephone plunked atop a stool beside the singer throughout the evening. A first time sighting of its kind for this reviewer. Arguably having one of the best rock voices of all-time, there was a bit of skepticism going in to this show for the condition of Cornell’s pipes after having to call in sick, just one night prior in Poughkeepsie, NY. If he hadn’t openly admitted he wasn’t exactly feeling 100%, even comparing it to the coming down feeling of his drug days, the one or two minor blips went practically undetected. “I love Toronto very much” were just a few words of gratitude Cornell expressed throughout the evening. He spanned his entire career, offering up acoustic renditions of his classics Soundgarden/Audioslave/solo anthems, deep album cuts, and even a number of covers including a highlight rendition of Led Zeppelin’s “Thank You”. Early on he mentioned he had a list of roughly 25 songs he was going to play throughout the evening, but welcomed requests from the audience if there was anything in particular anyone wanted to hear. I then welcomed this opportunity to bellow out a personal Soundgarden favourite “Like Suicide!”, in which he actually obliged. The biggest treat of witnessing an intimate acoustic performance of this nature is not only hearing the classics peeled back to their barebones infancy, but the stories that go along with the songs and how they were originally conceived. Painting a clear picture while telling a story is a quality Cornell is extremely good at. He even put down the guitars entirely for “When I’m Down”, singing only to a vinyl recording of a piano on a record player setting the stage for a complete living room feel. Some of the more interesting moments of the evening were the acoustic portrayals of tracks from Cornell’s failed Timbaland produced 2009 electro-pop album, Scream. Knowing how these songs could have originally sounded had Cornell stuck to the guitar-driven course opposed to taking a perplexing R&B direction, it was enough to ponder ‘what could have been’ and temporarily forget the blunder he made just 2 years ago. Evening highlights included “Fell on Black Days”, “Seasons” originally found on the 1992 Singles soundtrack, a dramatic cover of Springsteen’s “State Trooper” in which Cornell himself deemed “F**king cheating” as he sampled himself playing back-up as a second guitar part, and most definitely “Hunger Strike”, a flawless solo effort after admitting he was nervous attempting of what is originally a two-man duet with Pearl Jam’s Eddie Vedder. The evening ended with Cornell inviting the crowd up as close to the stage as they possibly could to take part in a lovefest sing along before setting off for the night, only to return for a three song encore. If you missed the opportunity to be apart of this extremely rare occasion, fear not as Cornell will be back in town on July 2 in full band mode with a reunited Soundgarden at the Molson Amphitheatre. Much larger scale mind you, but after a 15 year absence since we last saw the foursome play in these parts, it’ll undoubtedly be the must see show of this coming summer concert season.